Greetings Travel Seekers! 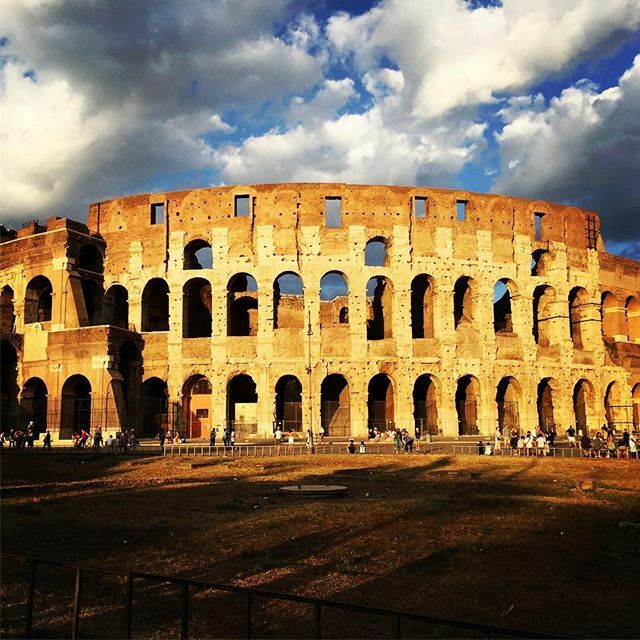 Are you planning a trip to Italy but contemplating leaving Rome out of your itinerary? Well this blog post will certainly argue otherwise. When we were planning our honeymoon destination, some people tried to strongly advised us from going to Rome. If we had listened, we would have missed out on one of the most breath-taking and romantic places we have ever been in the entire world! Like every place, Rome certainly has its pros and cons. Sure, my boxed mac and cheese is better than the pasta you will have right outside the Vatican or the Colosseum. 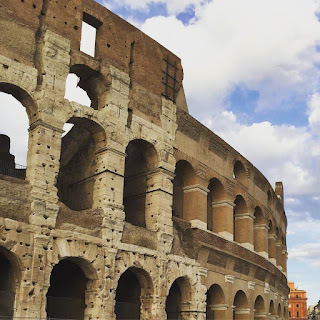 However, out of all the countries we have explored (and we have explored many), nothing made my jaw drop more --- literally... than the Colosseum. It is spectacular in size and architecture... it is a must see and please don't worry, the food is delicious once you travel down a road or two away from the tourists. Another con-sideration is you may be asked by some local merchants near the major tourist attractions to buy a selfie stick, a scarf or a bottle of water. 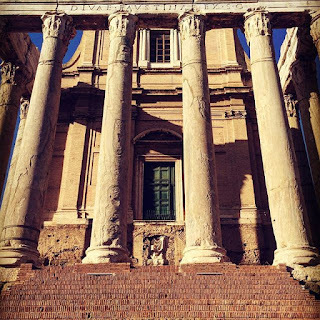 To be perfectly honest, the water came in handy and in our opinion it all has it's charm... because you are in freaking Rome... and it certainly wasn't built in a day! If you are looking for instagram worthy photos look no further than Rome. Every street corner has its charm and elegance. The architecture is to die for and the history is so interesting. My personal favourite thing to do was to walk across Rome all the way to the Vatican on our last day. It took us 14 hours round trip by foot, but that's accounting for our stops along the way to dine and get a foot massage on the way back. Do we regret starting our trip off with a hop on hop off bus? Definitely not, since it was how we got our bearings but once you figure out this place, Rome begs its visitors to soak in the history and culture step by step, rather than zip by in a car or bike. At nighttime, the lights come on, the nightlife begins and the sweet sound of Italian street performers wraps your heart like a warm blanket rich with the fabric of culture. No, we didn't get mugged and yes it safe. Just be mindful of your belongings and you will never regret visiting this amazing destination. Have a Math Night at Your School! Just yesterday we had a fabulous turn out at our Math & Music Night. We decided a good way to bring families into our building was by asking families to come to the school to see their child's musical performance. Once parents came inside, they were greeted by two of our lead teachers at the welcome table. They provided families with information on when their child's musical performance will take place and a"math passport". The math passport encouraged students to come visit each learning center and receive a signature. One students got a full page of signatures (and we rewarded effort with a signature, not necessarily success), they got a take home prize (pack of cards, dice, games to play at home with the family). Students had so much fun visiting each learning center. See more of the pictures below! Each center was led by either a grade 8 student or a teacher. We were even fortunate enough to have our very own Vice Principal lead one of the centers! We selected activities that were shared at the Annual Quest conference, activities we have done in our own classrooms, activities we learned about at staff meetings and activities that are aligned with our school focus (e.g. growth mindset). Some activities even encouraged parents to get involved! The smiles on everyone's faces and the fun we all had made the whole experience so much fun to be part of! This comment is something I have both said and heard from my colleagues about our students. It is something that has me wondering about our mathematics instruction. I have learned through my journey in mathematics education that we need to intentionally select and/or offer manipulatives and models that can help support students in completing rich math tasks. I also have learned that we need to explicitly teach and offer a shared experience of using manipulatives rather than presume that students know how to use them and that they will. However, I am still puzzling over the fact that there are teachers out there doing these things and students are still hesitating or outright refusing to use math manipulatives. 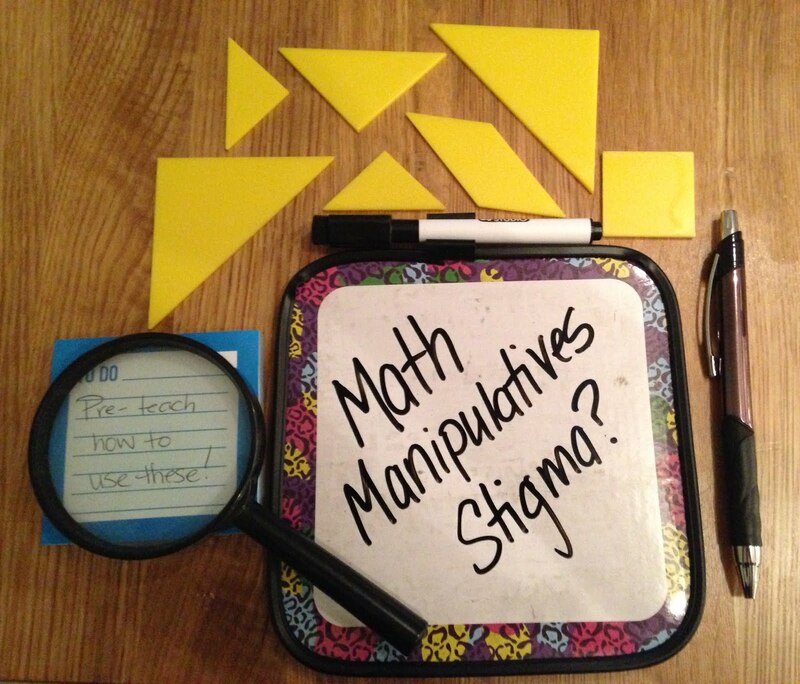 It has me wondering: Is there a math manipulatives stigma? That’s when I started to reflect back on my own experiences learning math. I never used manipulatives. Well, maybe that’s not entirely true. I used manipulatives when it was socially acceptable to do so, when we were using graphing calculators or when we were all using protractors, you know as an entire class…but definitely not as a free-thinking student. You never caught me dead busting out the counters or tangrams. In fact, I didn’t even know what tangrams were until I got into the education field and a rekenrek? You got to be kidding me! When I think of my education in elementary school, I only ever remember kids being encouraged or offered manipulatives when they struggled. I actually remember being discouraged from using counters if I already had rote counting down. Jo Boaler’s current research supports students using their fingers to count. This is fantastic and I hope it will help make a lasting shift in mathematics pedagogy. But is it enough to break what I am proposing as a real problem in our mathematics classrooms today: Math manipulative stigma? That I am not so sure. I know I had a genuine fear that my peers would identify me as “dumb” at math if they caught me using them. I felt that if I touched manipulatives I was “giving up”. I wonder if this belief is still widely held? I wonder if we educators have had enough conversations about this? And what about the parent community? What messages are we putting out to them as our partners in education? Have we offered enough experiences using manipulatives beyond the primary grades to our students in order to interrupt this kind of thinking? With technology these days and web-based tools like “mathies”, manipulatives are becoming more and more accessible and in theory, also easier to disguise. Are students disguising their use of manipulatives? Are they hiding the fact that they are using their fingers? What can we do to help encourage and honour the use of manipulatives in our mathematics classrooms? It's almost approaching a year since I had the amazing opportunity of being a staff supervisor for a group of 15 grade 5 & 6 students from LSPS who got a chance to participate in a 6 week art intensive program offered by McMichael Art Gallery, last January and Feburary 2016. Our school was lucky enough to take part in this “Visual Outreach Initiative Creating Empowered Students” (V.O.I.C.E.S.) developed by McMichael Canadian Art Collection professional artists/educators in partnership with YRDSB. The program is designed to engage students who would otherwise not be engaged in school and is an opportunity for them to be immersed in art curriculum as well as an opportunity to express themselves in alternative response modes. There was no art experience necessary for these students to take part. The program included 5 day trips to the McMichael Gallery and one follow-up trip by the Gallery to our school. I had a chance to bond with students that I wouldn't otherwise get the opportunity to know. I watched students who struggled to communicate advocate for themselves to voluteer staff at the McMichael Art Gallery about their need for a "fidget toy" and do some on the spot teaching about themselves and their strengths and needs. For my students with exceptionalities, this program has meant improved social skills, self-advocacy and an entry point into the curriculum. The Arts is a way in which all of us can communicate what is in our hearts. I watched students who struggled with mental health find a healthy outlet to express their emotions through using their sketchbooks and I saw the sense of pride and wonder on each of these students faces. I have received media release form consents to showcase the students on this trip and their journey exploring the gallery and various art forms. I highly recommend this program and will let the pictures speak for themselves. Thank you McMichael Art Gallery for making a forever impact on our students at LSPS. Even a year later, the students and I still bond over the life changing experience. Thank you to Bonnie and Christina our art leader-facilitators and to Pauline who all helped make this experience possible!